This version of the Tunse'al Setting Guide is systemless: It does not contain any rules. However, there are tables to help you translate the setting information to whatever game system you choose. For the Savage Worlds version, go here. Play in a world where technology is slow to advance, tribes are divided by great geographical expanses, trade is fraught with peril, dinosuar-like beasts co-exist with people, and the very environment poses danger to your party. 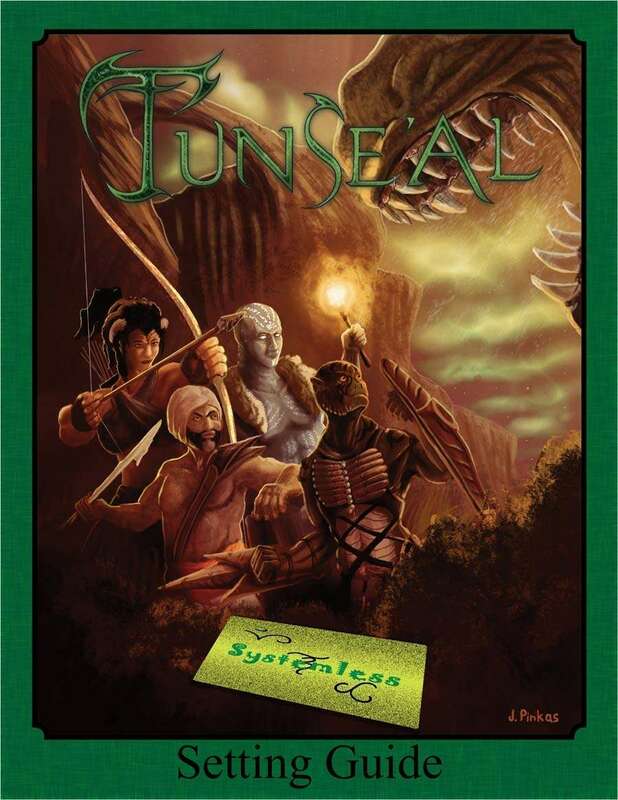 Tunse'al is a tribal, fantasy setting with four playable races that are outside the norm. The swamp-dwelling Kresh are an amphibious, genderless race committed to ensuring their sacred land, The Wetlands, and as much of Tunse'al as they can protect is safe from greedy destruction. The cold-enduring Gelid use their pathfinding ways throughout the long stretches of the Baarek Mountains to explore and make peace wherever possible. The towering, red-skinned, two-horned Korrin pursue all things with passion in their free-form society of The Footlands where families don't conform to any set parameters. The thick-skinned, nomadic Gales with eyes resembling a snake's wander The Drylands in search of desert gems, tar, and other commodities no one else would have any hope obtaining. The Skin Eaters of The Dreamlands round out the dominant races, although they are only at the GM's disposal. They are the treacherous, twisted cousins to the Kresh. In her madness, their creator, Sa'ra, decided to pay back her brothers for an earlier wrong, making the Skin Eaters dependent upon others' skins in order to live. They are not mindless, but no tribe trusts them as historical attempts to have a respectable relationship have always ended in bloodshed. Then there is the prophecy that they will one day convert the Kresh to their cause to conquer the other Tunse'als in honor of Sa'ra's predicted awakening. That hasn't helped anyone want to sign-up to be there best friends. The book contains an wide array of world information with detailed descriptions of each land's properties, the history of the peoples, character creation information with each race's parameters, a cross-section of beasts and fae that would be found throughout the vast land, a map, ten pre-generated characters, and a blank character sheet. It does not include a campaign, but does give ideas of what could be done with Tunse'al. Additional products are scheduled for those who enjoy pre-written adventures.